High incidence of obesity (joint pressure). Technology is pivotal to market uniqueness and rapidly implementing new expertise in favour of patient wellness. 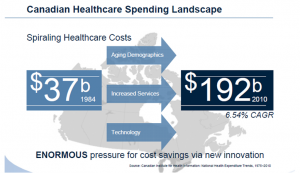 The healthcare system will be forced to make more of every dollar invested. Innovation and the creation of new manners of dispensing care will soon be required. The Living Lab fits into this logic. Management has refined the company business model, proposing to specialize in the musculoskeletal system, creating a network of collaborators and sub-contractors, and acquiring laboratories (distribution network) through which positive Living Lab findings can be marketed, or redirected through its network of subsidiaries. Markets serving these fields of activities are highly fragmented. This is partially due to the current assessment protocols and artisan manufacturing practices of the vast majority of laboratories. Markets should first be consolidated – but without more objective assessment, manufacturing and measurement tools, such restructuring is impossible. Developing and integrating these objectives is the raison d’être for the Research and Development Department at Ergoresearch. The North-American foot orthotics market is estimated at US$1B+ annually. Add to this another US$1M, if one takes into consideration orthopedic footwear and other foot care products. $1.3B – Retail and mail order footcare product sales. We estimate that 12% to 15% of the North-American market could benefit from wearing custom fit 3D foot orthotics. Osteoarthritis is the most common form of arthritis, and one of the leading causes of functional impairment. This disease can occur at any age – aging however being one of its leading risk factors. The occurrence of osteoarthritis generally appears around age 50, and its prevalence increases with age. All current treatments aim to slow the evolution of the disease and relieve pain, but no cure has been put forth to date. For the time being, surgery alone has provided good results. It is nevertheless very expensive (over $40,000), invasive and rehabilitation is often quite lengthy. Generally, orthopedic surgeons recommend surgery only when mechanical and metabolical treatments (anti-inflammatories, corticosteroids, etc.) no longer offer functional improvement or pain relief. An arsenal of non-pharmacological treatments is nevertheless available: Physiotherapy, weight loss, viscosupplementation treatments, walking aids, foot and knee orthotics. Despite the thirty or so available treatments, not one provides outcome results above the 0.8 mark – the threshold beyond which pain relief is rated as significant. The consequence is tragic for patients who must next turn to a number of healthcare professionals for additional advice and treatment. Steps are complex, long and generally inconclusive – and further aggravate an already taxed healthcare system. 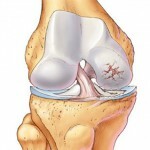 Total knee replacement surgery is estimated to cost over $40,000. With an outcome result of 1.8, surgery has been the only method to date to present a decrease in average pain intensity –– yet it still remains well above the 0.8 pain relief threshold. Exclusive orthotics and ortheses featuring our unique Ergoresearch design offer us a clear advantage over the spectrum of other efficient treatments available today.